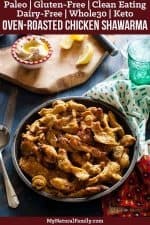 This oven roasted chicken shawarma recipe is a basic recipe that can be served over rice, with pita bread and or garlic paste. I first tried chicken shawarma at a Middle Eastern restaurant in Sunset Beach, CA at a restaurant called Golden Olive. It’s a small family restaurant in a strip mall and not very impressive until you try their food! I loved it and we ate there several times on our trip. They served all types of Mediterranean and Middle Eastern food. I think the owner is from Egypt. They have the best pitas with garlic paste. I went home and tried to replicate the recipe. 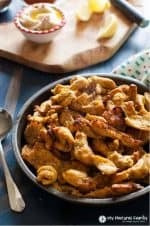 Because oven roasted chicken shawarma is traditionally prepared by stacking the meat and continue roasting it over an open flame, then shaved off into small pieces, it’s a little hard to replicate in its exactness at home. I got as close as I could by marinating thin slices of chicken in spices and then broiling it to get lots of charred crispy bits and nice caramelization. So this recipe can be made and then turned into a couple of different meals. The simplest would be to put it over jasmine rice. Or one of my personal favorites would be to put it inside of homemade pita bread with all the toppings that I enjoy. Some topping suggestions are avocado, cheese, tomato, onion, spinach, greek yogurt, etc. 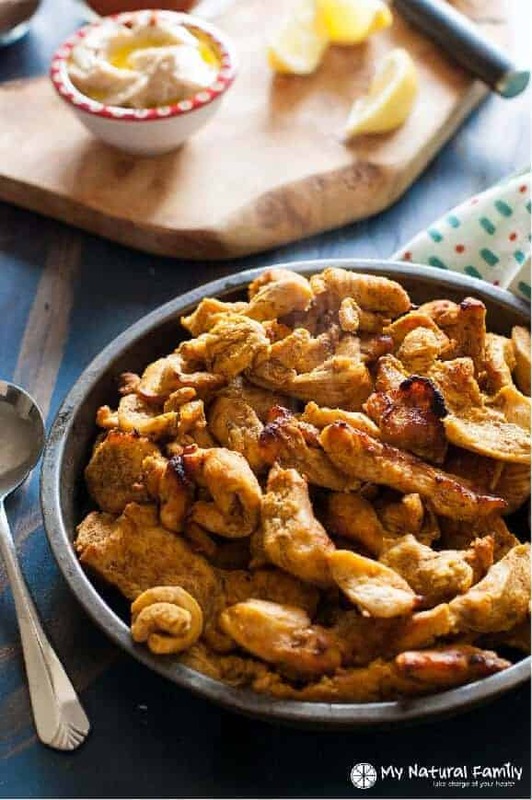 Comment below on how you think you would enjoy eating your oven roasted chicken shawarma and tell us about people you think would enjoy the recipe. This is my version of chicken shawarma and it was created by marinating thin slices of chicken in spices and then broiling it to get lots of charred crispy bits and nice caramelization. Cut the chicken into thin slices against the grain. Place chicken in a mixing bowl. add the remaining ingredients to the chicken and toss everything together until spices are evenly distributed and chicken is well coated. Cover the bowl and let marinate in the fridge for several hours. Set the oven to broil on high. Place the chicken in a single layer on a greased baking sheet. Place on the top rack of the oven and broil, watching closely. Every 2 minutes, check the chicken and once it starts to brown and caramelize on top, remove the baking sheet and turn the chicken pieces over. Broil again until the other side of the chicken is golden brown and fully cooked. Serve over rice, or in pitas with toppings. 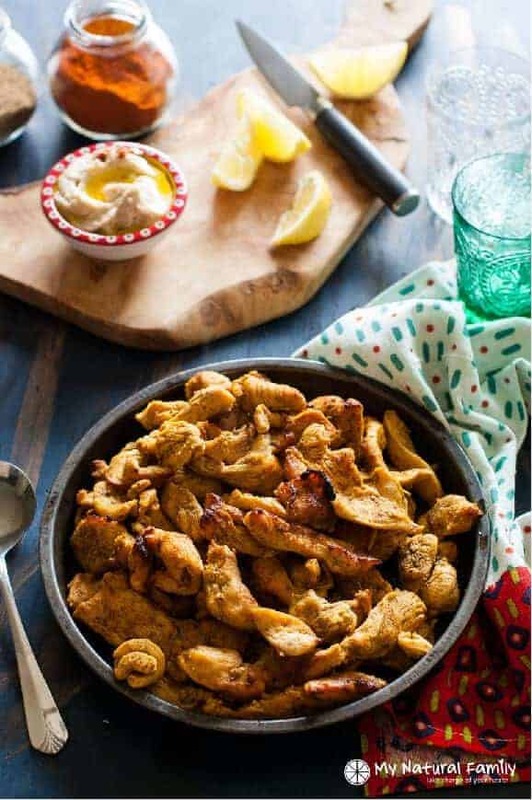 Thank you for shawarma recipe, I really really like the way you explained it, Me and my family like shawarma when we ate it in asian restaurant so i’m going to try this one in upcoming weekend where we set together once in a week so this will be amazing can you please tell me if i use persian saffron in it ? I’m not sure because I haven’t tried it myself but it sounds like it’s worth a try. What do you do with the lemon…. your recipe just says “lemon”, with no instructions as to what to do with it. Zest? Juice? Cut up? I’m glad you asked. I apparently missed that important information . . . It’s just the juice of one lemon. That’s what makes up most of the base for the sauce to put on the chicken. This sounds really good. I’ve been to that restaurant so I’m really excited to try it. We just made this for dinner tonight along with some paleo naan. 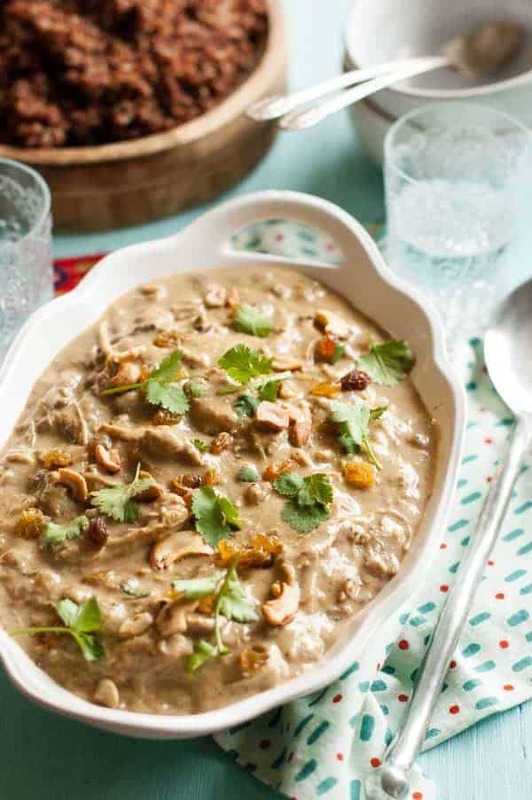 Such a fragrant and flavorful dish! It is definitely going in the rotation. Thanks for a great recipe! I’m so glad you like it! Thanks for taking the take to come back and comment too.